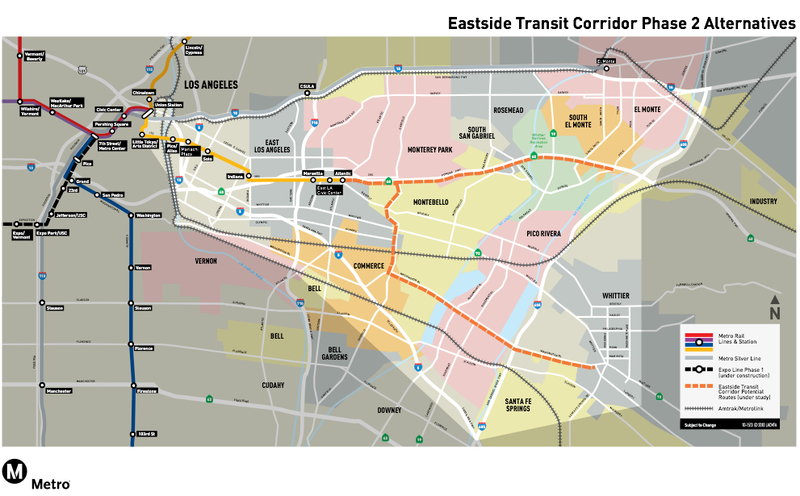 The first of the two meetings on extending the Eastside Gold Line further east is tonight at 6 p.m. at the Montebello Senior Center at City Park, 115 South Taylor Avenue. We will be conducting two public meetings September 21 and 22 to provide an update on the Draft Environmental Impact Statement/Report (Draft EIS/EIR), which studies extending the Metro Gold Line to cities farther east of Los Angeles. The Draft EIS/EIR evaluates two build alternatives, SR 60 Light Rail Transit (LRT) and Washington Boulevard LRT, in addition to the required No Build and Transportation System Management (TSM) alternatives. The document will be ready for public review in the spring of 2012. Communities in the project area include City of Commerce, Montebello, Monterey Park, Pico Rivera, Rosemead, Santa Fe Springs, South El Monte, Whittier and unincorporated portions of Los Angeles County. We will inform the community on the latest study developments, including environmental and engineering status, urban design and station planning, and environmental process milestone dates and schedule for the Eastside Transit Corridor Phase 2 Draft EIS/EIR. From 6 p.m. to 8 p.m.
How is it that the gold line is built so rapidly but it takes decades to get anything done on the westside? What happened to the 405 corridor project? I don’t think I would say the Gold Line was built rapidly! It took a long time to plan, build and fund the current Gold Line, as well as the Extension that is now underway. The 405 corridor project is just beginning the planning process. We’ll write more as things move along. And how much of this project will cost taxpayers down the road if it gets built? Flat rate $1.50 from El Monte or Whittier to Union Station can’t be sustained forever. 20% sales tax? True, but it still doesn’t explain why the 405 corridor and west LA have been ignored for so long. The 405 and the 10 are some of the most congested corridors, yet projects are only being planned or beginning construction. Why were the westside and the 405 corridors put on a lower priority than the Gold line it’s many extensions? The Westside could have had the what is now the Purple Line along Wilshire Blvd. to Santa Monica 30 years ago. The residents on the Westside in LA and Beverly Hills choose to have their congressman offer a bill, that passed, to block the project due to the “excuse” of safety concerns. The same could be said of the 710 gap project that that tax hating crowd seemed to have overlooked. Highways don’t generate ANY revenue to cover their maintenance and the gas taxes that use to do the job are so low that they have been coming in short year of year deferring maintenance until new funds can be found. Both of these routes are wrong, should have gone straight down Beverly/Whittier with a mix of street running and slight trenches at key busy intersections (like Flower/Expo near USC). At this point, lets go with both. The routes are spread far enough apart to get coverage to a wider area. Since that won’t happen, go with the 60 route down and set it up with major park and ride lots at all the stations and attempt to steer riders off the freeway. 2 stations on either end of the Montebello down center and extend past Peck Road to near the 605 to a large park-n-ride connection to Metrolinks Riverside line. Future extension into La Puente, City of Industry would also work. Not quite as far as Gold going to Montclair or even Ontario airport. The Washington line wanders too much and the elevated stretches are just too expensive and puts a large blight on the landscape. I agree with others, this line, unless done right, needs to drop down in priority after Crenshaw, Wilshire, 405 etc..
Have it turn south through SFS and end at the Green Line eastern end. This would give those in the area a better alternative to taking the Green to the Blue to get to downtown. There should be no reason why the 2 routes can’t co-exist. Give them letters like the NYC Metro does. The line that would go through ‘Crossroads’ and on to Industry (and maybe out to the stadium) would be useful as well. Both of these routes would do well to and express trains that actually bypass the stations (not go through them), ala NYC.